Complements a modern kitchen décor. 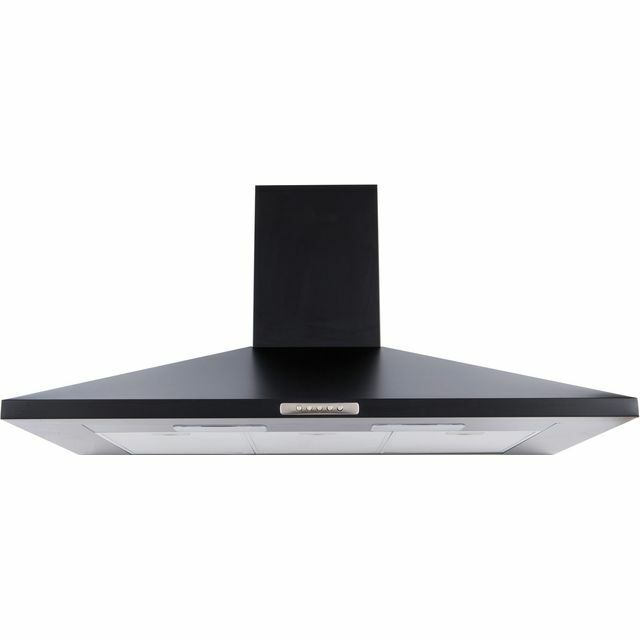 Unwanted cooking smells can be gone in an instant with the New World UH100B chimney hood in black. Measuring at 100cm wide, it’s designed to sit above your hob and leave you with an odour free environment. The sleek stylish design slots into your kitchen with ease and it brings a modern style to your home. With 2 halogen lights and a choice of 3 fan speeds, it allows you to see what you’re doing and eliminate smoke and smells from your kitchen. Great product and service from AO, best price around. Good product and easily installed. As good as much more expensive versions. Just love our new cooker! We were worried about how controllable the heat would be on the hob BUT it’s fantastic. The controllability is spot on! The hob rings are very responsive. The controles are easy to operate and the Overns are a good size. Can’t wait to do the Christmas baking!! Very well priced and worth every penny. So pleased with both items. Best price available and delivery was perfect - on time and to suit the installation of our new kitchen. Our new cooker hood was delivered a few days ago and we are delighted with it. It looks good, fits perfectly (we took time to watch the video on how to measure up for this) and seems to do the job.